No dogs die in the telling of this story. Jocelyn Hillier and her mother live in an expensive, beachside summer vacation town in Delaware. They're not rich, though. They're locals, and run a laundry service for summer visitors. And one day, Jocelyn is out for a run, and winds up saving a Labrador from getting hit by a car and killed. In the process, she meets both Peter Allardyce, owner of Carmen whom she has just rescued, and three other very expensive Labs, all of whom have prestigious pedigrees, and Christopher Cantor the Third, a young man both handsome and rich, as well as very charming. Despite her mother's warnings against having anything to do with summer people, or rich people generally, Jocelyn is soon exercising Allardyce's dogs, and dating Chris. Chris isn't the prize he seems, but on the other hand, elderly, misanthropic, and tightfisted, turns out to have a higher opinion of her than she had any basis for suspecting. She finds out when he dies suddenly. 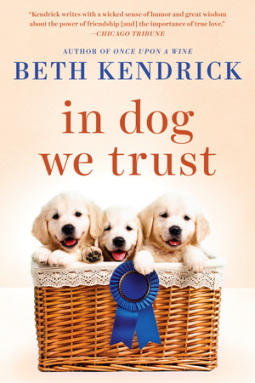 What follows is a wild summer of sudden wealth, a custody fight over the dogs, a struggle with Allardyce's estranged son over ownership of the beach house, and revelations about old friends, her own estranged father, and the stranger aspects of the dog show world. Frozen sperm! Unacceptable colors! The huge stakes for high-ranked dogs competing with other high-ranked dogs! Puppy contracts! Not to mention friends who turn out to have real fortune-telling gifts, and an "ugly" painting gifted to her from her estranged father that turns out to be something a great deal more. It's a lot of fun. The dogs are great, the people are likable and interesting, and the oddities of the dog show world and purebred dog breeding are displayed without being mocked. Did I mention the dogs are great? And that Jocelyn is a great dog owner? Oh, and there's a good romance included, though it isn't with Chris.